The electrical system in today’s homes is complex, and includes high and low-voltage wiring and fixtures. Strict building codes apply to all residential electrical systems, since improperly installed or defective electrical wiring and fixtures can cause dangerous, destructive fires. That’s why homeowners should only trust qualified professional electricians to handle repairs and installation of these systems. Repairing Defective Outlets and Fixtures – If an electrical outlet in your home isn’t working or light fixtures and ceiling fans are broken, it could be a sign of a problem with your wiring. Call us for fast, cost-effective repairs. Circuit Breakers that Keep Shutting Off – If you are constantly resetting circuit breakers in your home, that could be a sign of overloaded circuits or short circuits somewhere in your electrical system. Don’t delay. Call us for a fast assessment and repairs. Flickering Lights – If light fixtures in your home flicker, call HandyQuick. There may be loose connections or other problems that could create excess heat and even cause a fire. New Electrical Fixture Installation – Anytime you’re planning to add a new electrical outlet, lighting fixture, ceiling fan, or other built-in electrical fixture, a qualified electrician from our Twin Cities handyman service will do the job properly and efficiently, at an affordable cost. GFI Outlets for Interior & Exterior Use – Electrical outlets in kitchens, baths, laundry rooms, and exterior outlets should include a Ground Fault Interrupter for your safety. In older homes and for new outlets, our electricians can replace or install new GFI outlets. Smoke & Carbon Monoxide Detectors – If your home has no smoke and CO detectors, or too few detectors, call HandyQuick for correct installation of new or replacement detectors. These detectors should be replaced after being in use for more than 8 years, and we can make those replacements for you, as well. 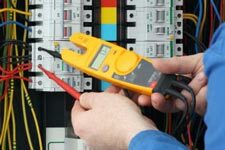 Low Voltage Wiring – Our skilled electricians can quickly install and repair all low-voltage wiring in your home for telephones, doorbells and thermostats, along with television, telephone, and computer network cables. Get the job done right by our experts. Electrical Service for Remodeling – If you’re adding a room, remodeling existing rooms, or finishing a basement, rely on the skilled electricians from our handyman service to handle all electrical needs for your remodeling project. Electrical Service Upgrades – Many charming older homes in Minneapolis St. Paul have inadequate electrical service. Whether you own such a home or are putting an older home on the market, upgrading that home’s outdated electrical service adds value and safety to the home, and may be required by insurance companies. Trust these service upgrades to our electricians. Anytime you have electrical work done in your home, insist on qualified, experienced electricians, like those who are part of the professional team at our Twin Cities handyman service company. Unlike some services, we are fully licensed, bonded, and insured, and use only fully qualified electricians on our team. As a licensed general contractor, we can assure you of high quality, affordable electrical work in your home. Call us today with any electrical repair, emergency service or installation project, and we’ll provide courteous, prompt, efficient electricians with the expertise and experience you demand and deserve.